Just like airliners in Second Life (see Brussels Airlines and Air France - KLM) a mail company in Second Life could be seen as a 2008 Metaverse Oddity, for surely, you don't need a mailman in a virtual world like this. If you buy virtual goods, they don't need to be delivered as they appear in your inventory immediately and can be rezzed anywhere you like. You don't need a mailman either to deliver your postcards to the ones you love, as Second Life has a built-in service which delivers your snapshots through email. 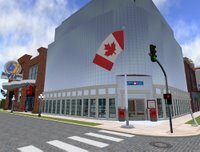 Yet Canada Post isn't the odd one out in Second Life. Or maybe it is, in a positive way. The Canada Post presence in Second Life is one of the second wave corporations to explore the metaverse, and like the German Volksbank, they have a different approach to things than most of the first wave explorers had. Like the Volksbank they don't have a dedicated sim which is destined to lay bare once the 'grand opening festivities' are over, they bring a variety of shops on their sim. The Canadian Post venture is called "Maple Grove" but won't be found on the island called maplegrove but on one called Solar. The sim is a heavily built urban sim which makes it rather slow to render, especially if you use 'ultra detail' settings like me to take some nice pictures for you folks. 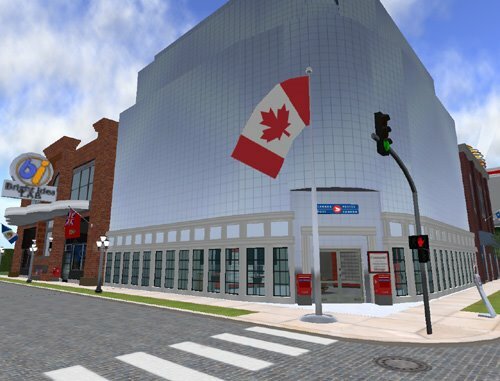 Once immersed at the center of the sim you'll find yourself amidst a variety of builds, one of which, obviously is the Canadian Post postoffice. Welcome to Canada Post's Maple Grove! Canada Post is proud to showcase its 2008 partner retailers. 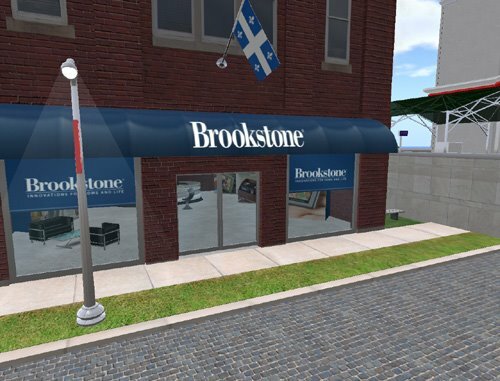 Explore Maple Grove and discover the largest collection of real-life retailers sharing one sim in Second Life. 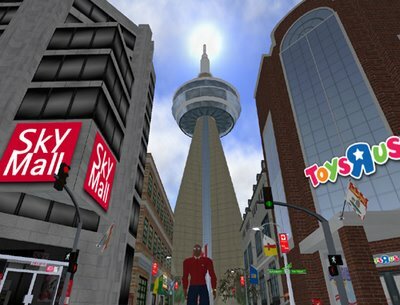 In the city centre, you can visit Toys R Us, Sky Mall, The Shopping Channel and Canada Post. New this year, we are introducing the Bright Spark Lab. 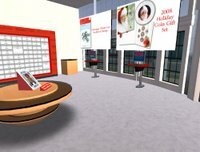 The Lab is a virtual marketing agency designed to assist Second Life entrepreneurs. You will find free tools to make you Second Life business more successful. You will also find valuable information for creating a direct mail campaign in real life! 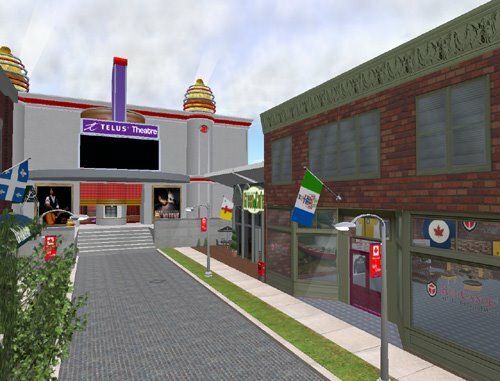 On Maple Street, we have a busy schedule of live music events at the Telus Theater. 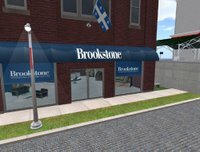 Be sure to check out Brookstone and Red Canoe. Don't forget to stop in the Green Cafe which has information about keeping your mail "green". Blackberry Lane is home to Sears and the Canada Post garage where you can get your own free mail truck. On Hudson Avenue, you will find the Everything Olive store next to the Tower. Thank you for visiting Maple Grove and be sure to leave us some feedback at the Canada Post office in the city centre. 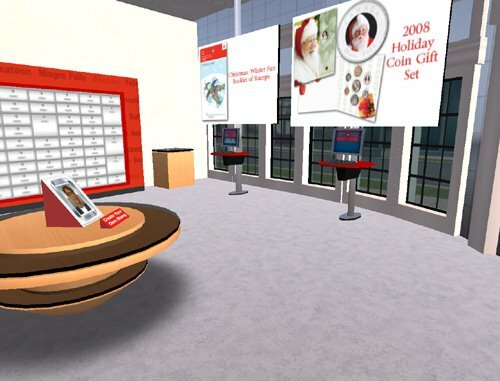 Most shops present on the sim put on a showcase of a number of items you can buy in their webshops and have the items delivered to you by Canada Post at home in the real world. I think this type of presence will work better than a sim dedicated to one brand only, as it kind of works like the old fashioned way: You go downtown to visit one store, you walk past another one and walk in on impulse. I can understand Canadian Post offering this selection of shops, as they are real world partners in shipping, but I wonder how many virtual shoppers this particular combination will draw. 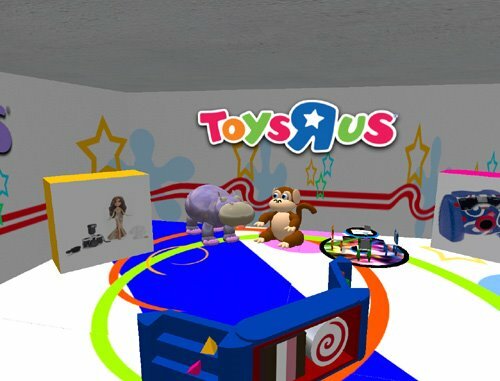 Perhaps it would have been better to mix the real life companies with popular inworld shops. There is a downside to this type of presence though, as it is quite a heavy urban build, it is very slow to render if you use a higher graphics setting. 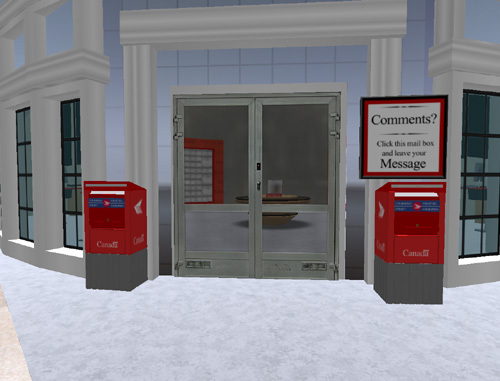 I don't think you can blame Canadian Post for this, but rather an unavoidable feat if you're working in Second Life. 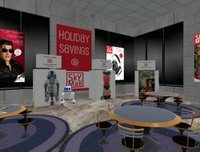 If corporations slowly start to work out their act in the Metaverse and start doing sensible business, companies and customers alike would like (and rightly so) a better performance from MSP's (Metaverse Service Providers) like Second Life. If performance can't be boosted to have a decent shopping experience, then maybe Second Life isn't the place to be for shops. In my previous post I already did some forecasting on 2008 and 2009 in terms of where the NVE industry is going. Today, Virtual World News (the guys from the VW Conferences) released a survey on the trends for 2008. In this survey some 45 industry leaders participated. For a good overview of the contents of the 36 page whitepaper visit Fleeep's blog. My general observation is that each of the respondents is very positive about the developments of the industry. 2008 will see explosion this, massive growth that and so on. Since the majority of the respondents are either from MDC's (Metaverse Development Company) or from MSP's (Metaverse Service Provider) this positive view can be expected. I'm not sure it's fully safe to base your investment plan on their opinion. and forget about Business Development. As a result of this disappointment, more MDC's will have to cut down capacity like ESC, or bring in different expertise. 2008 will see a slight shift from the current MDC's to more traditional IT companies like Sogeti or Capgemini who have longterm relations with their clients and a proper supply of Business Analysts who know their clients core business and have the ability to translate that core business to IT and VW solutions. The former means that 2008 will focus on integration, creating API's and mashups, providing data-mining tools etcetera. From a social point of view there will be disappointment in Virtual Worlds as well, mainly produced by lag and hardware power. 2008 will be a good year for NVidia, Intel, AMD and other hardware producers as both the Gameverse and the Metaverse will require a boost in sheer graphical and processor power. Another fundamental part of this new univerese will be the availability of bandwith as worlds like Second Life use streaming technology and are producing over 8 Gbps in data traffic. It will be up to Internet2 / Lamdarail to put their 100 Gbps network into full production (which will probably be beyond 2008) to service this bandwidth need. The Metaverse in general will concentrate in general on the Extraverse, the branded or themed worlds. Since we do not have the ability (in most cases) to translate our core processes into virtual representations, the NVE industry will still be an instrument in marketing media in 2008. As far as extraverses go, they will get more and more aimed at specific groups, for instance girl worlds like Barbieworld and GoSupermodel will grow rapidly. 4th quarter 2008 might see it's first VW specifically aimed at 50+ agegroups in beta. The majority of funding will be coming from governemental organisations exploring virtual worlds in serieous gaming ventures. Another challenge for Social Worlds will be the mashup with social networking sites like linked-in, Facebook and the likes. This also brings in the all important question of Identity Management (and in its wake interoperability and portability). On the part of Second Life we will see improvement in stability as Aric Linden's QA team will be finalising their tests on the new Windlight client in January, making it the most stable release Linden Lab has ever produced. Havok 4 will be implemented somewhere mid 2008 as physics engine. Aside from taxlaws and other governmental regulations the industry will gain some significance for retirment funding and insurance companies as more and more people will earn their living in virtual environments. A huge issue will be the "What if I die" scenario: What happens to my second life and my virtual assets when I'm no longer there. When I'm gone, who owns my identity, will there be successionrights? Okay, past bedtime now, the other questions will have to wait.